There is a charm in growing ones own vegetables and fruits, not to mention the exceeding good taste and unparalleled freshness that comes from being able to go from plant to plate relatively quickly. Indian vegetables are invariably difficult to find here in the United Kingdom, and being imported from far away places, tend to be expensive. The following article describes my attempts at growing Indian vegetables from seeds and any successes/failures and experiences gained from this exercise. As Indian vegetables such as Calabash (Lauki or Dudhi), Ridged Gourd (Turai) and Bitter Gourd (Karela) are essentially summer vegetables in India, they benefit from extended growth periods and hotter than usual climes if grown in the United Kingdom. 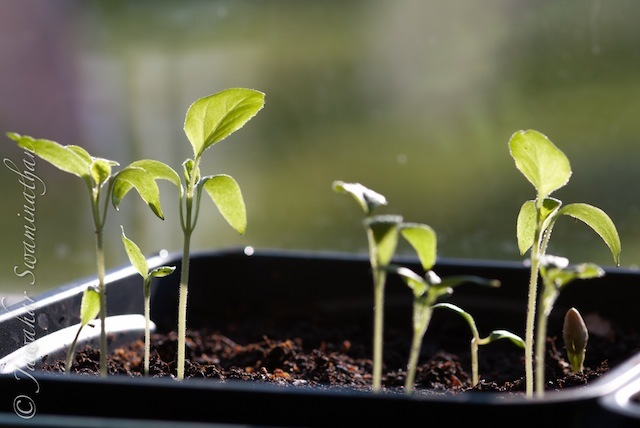 It therefore, helps to start growing these seeds in late-February or early March indoors. Seeds: I was lucky to be able to get good quality seeds of Calabash, Ridged Gourd and Bitter Gourd from Mahyco in India. These seeds are also available from specialist sellers in the UK. I have previously used seeds from market purchased vegetables and germinated them successfully, so that is also an option. 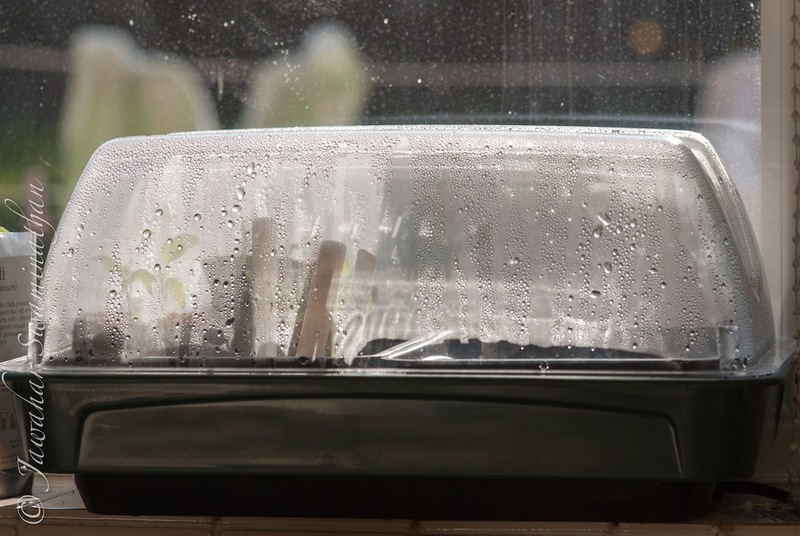 Propagator: In order to give seeds a good chance of germinating early, an electrically heated germinator is essential. I purchased mine from Amazon. (Link). The propagating trays were prepared by mixing in equal amounts of well sieved compost and crushed vermiculite to form a light mixture. The mixture was pressed down to form a uniform firm layer, with about 1.5cm space at the top of the trays. The trays were then watered gently with a rose sprinkler till totally wet and the compost-vermiculite mixture allowed to settle. 6 Calabash, 7 Ridged Gourd and 6 Bitter Gourd seeds were sown in two trays at a depth equal to that of the seeds. In all cases, the seeds were placed in a horizontal position, about 2 cm apart. The seeds were then covered with compost. The propagator was turned on to generate higher temperatures, and placed in a place with lots of natural light (window-sill) but no direct sunlight. 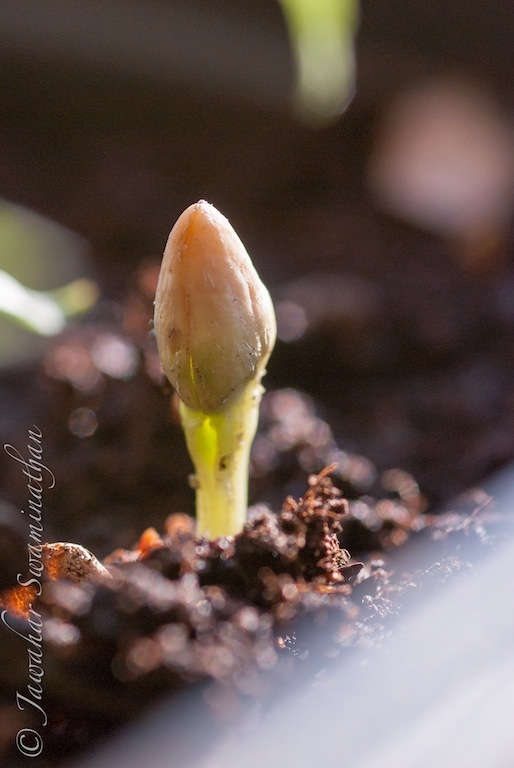 Lauki/Calabash: The first seedlings germinated within 3 days of sowing. All 6 seeds had germinated by end of the week. Ridged Gourd: First seedlings emerged in 4 days. All 7 seeds germinated by end of the week. Bitter Gourd: No germination after one week of sowing. It has been mentioned elsewhere the bitter gourd seedlings benefit from an overnight soaking in warm water to soften the seed coat. This is something I need to try next to see if it improves germination rates and/or speeds for this plant. Aubergine: I had also sprinkled some aubergine seeds on the surface of the compost in some available space on the tray. Most seedlings of aubergine had also germinated in the space of one week. The Lauki (Calabash) and Turai (Seedlings) were about 3 inches tall and beginning to grow their first true leaves. Aubergine seedlings were about one inch long and still only had cotyledons and no true leaves. Bitter Gourd: Two of 6 seedlings germinated in the second week (one pictured above). 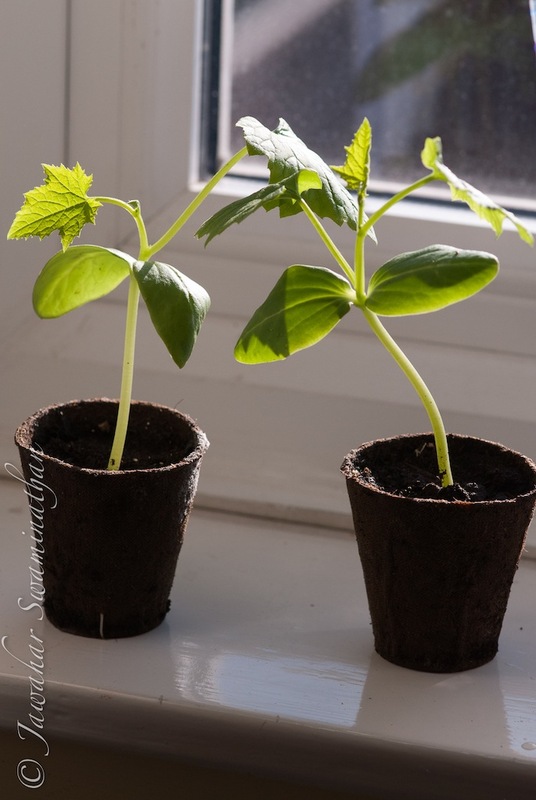 Once germinated, the rate of growth was very fast and by about 6 days post germination, they were about 2 inches tall and developing their first set of true leaves. The Lauki and Turai seedlings were ready to be moved into small pots at this stage. They were gently pricked from the propagator tray and placed into 7.5cm coir pots. 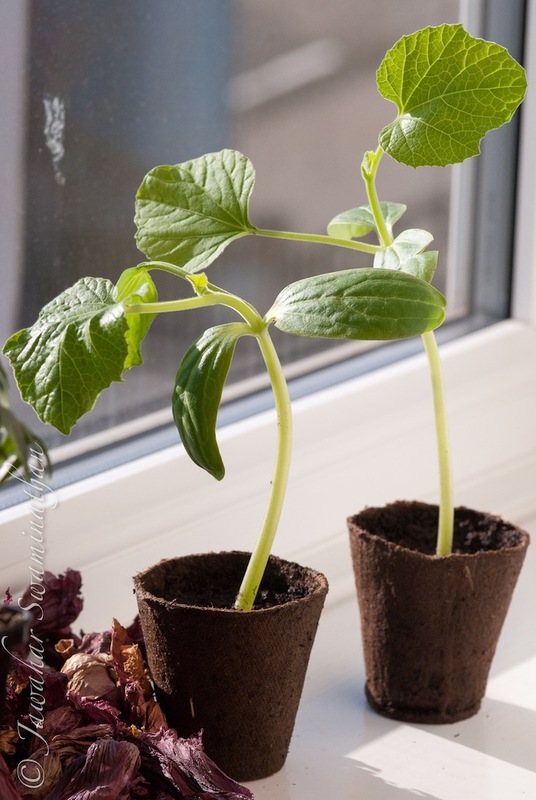 These pots have the advantage that roots can grow right through the pots as the plant grow, and the whole pot can be planted into the ground or grow-bag when the plants are ready to be placed in their final positions. The coir pots were filled with a 70:30 mixture of compost and vermiculite and watered till the pot was damp. In order to continue the growth of the seedlings and as it is still quite cold in the nights out here in Cambridge, the plants were all placed into ziplock bags. This helps in maintaining a greenhouse-like feel for the young plants and allows them to grow whilst still waiting to be transplanted outside in their final positions. With the bags it is also possible to allow the plants aeration by opening the top of the bags as and when necessary. But what of the aubergine seedlings previously mentioned? Well, they’re growing nicely in the propagator trays and should be ready to be moved out into pots in the next week or so. The exercise of growing these usually difficult to grow plants has been successful but I’ll keep updating progress on how these do in the coming days. At some point of time, the plants will be moved outside to harden off and acclimatize before going in the ground. Update: The plants (Lauki/Dudhi/Calabash, Ridged Gourd/Turi) were moved out into a temporary greenhouse at the beginning of the week to acclimatize, while still inside the zip-lock bags. They have now all grown to about 6 inches tall and have between 3-5 leaves each. The roots have begun to poke their way through the coir pots. In the late evenings, before sunset, I take them out carefully from the bags to expose them to light, but not direct sunlight. They go back into their bags before dusk. I lost a few aubergine seedlings due to ‘Damping off Disease”. Read more in this informative article here. The weather continues to improve and with temperatures expected to reach 20C this weekend, I think the plants will all be in their final positions by the beginning of April. Update: All plants continue to grow well in the greenhouse in their small pots. Unfortunately, the danger of frost has not yet passed so they are not in their final positions yet. Need instructions how to grow karela. Thanks for leaving a note. I’m not sure Bitter Gourd has been successfully grown in the UK as far as I have read. The temperatures and light are just not enough to grow them in large scale in Britain. My experiments with trying to grow them over the last 2-3 years have always ended in failure (the seeds germinate, plants grow to about a foot tall and then die off). how about other vegetables did they succeed to grow any vegs by the end od there life?